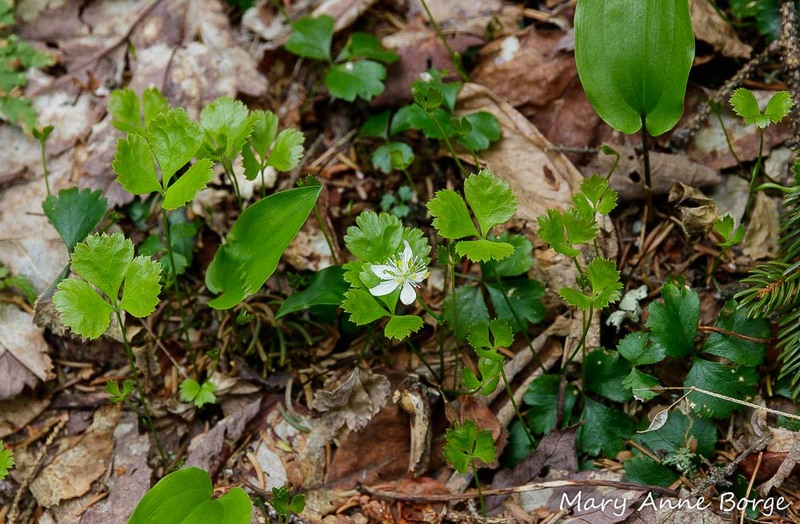 On a recent trip to Vermont, we spotted the bright white flowers of Goldthread (Coptis trifolia) dotting the forest floor’s green carpet. 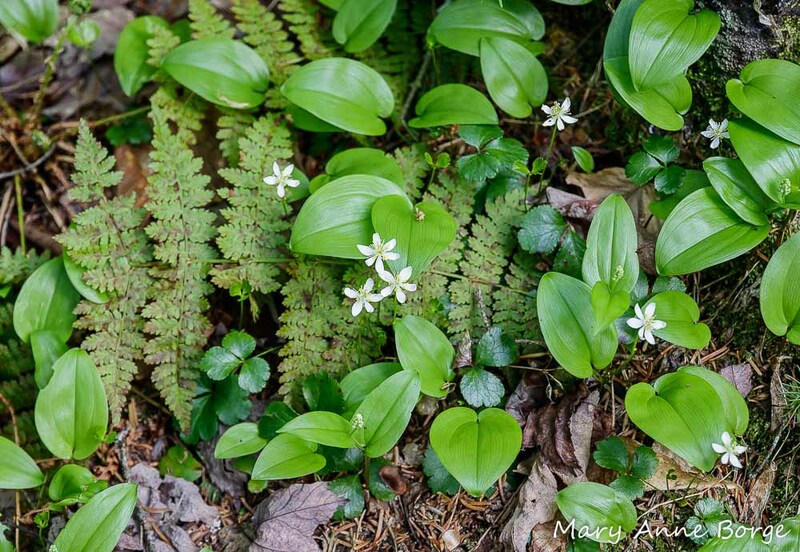 We saw it growing in mossy areas, and often in the company of Canada Mayflower (Maianthemum canadense) and ferns. 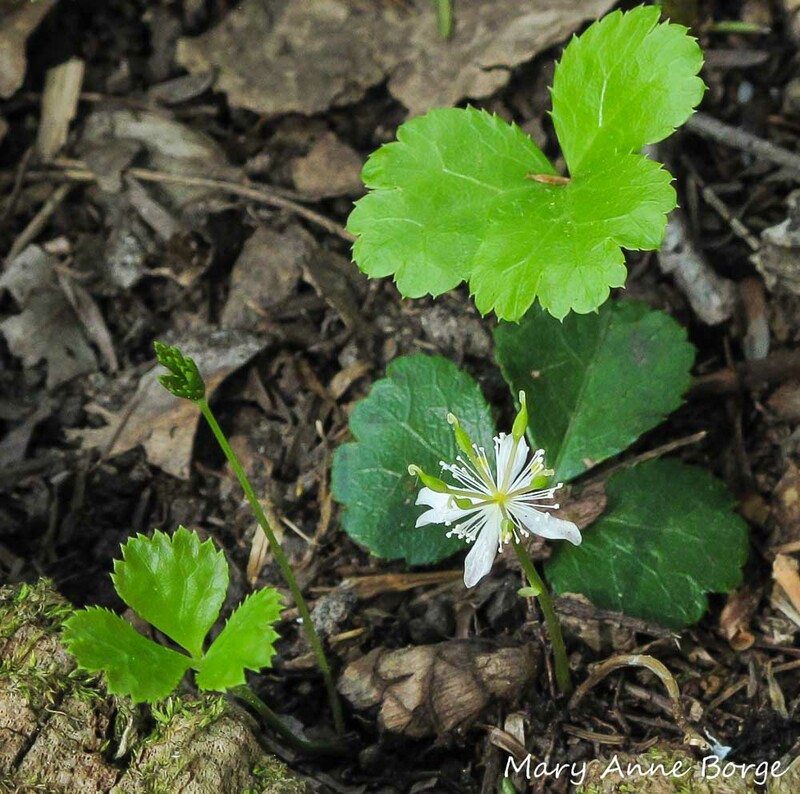 Our timing was perfect to see these tiny flowers, since each half inch diameter blossom is typically only in bloom for about a week. Each flower is perched about six inches (15 cm) from the ground on its own straight stem. 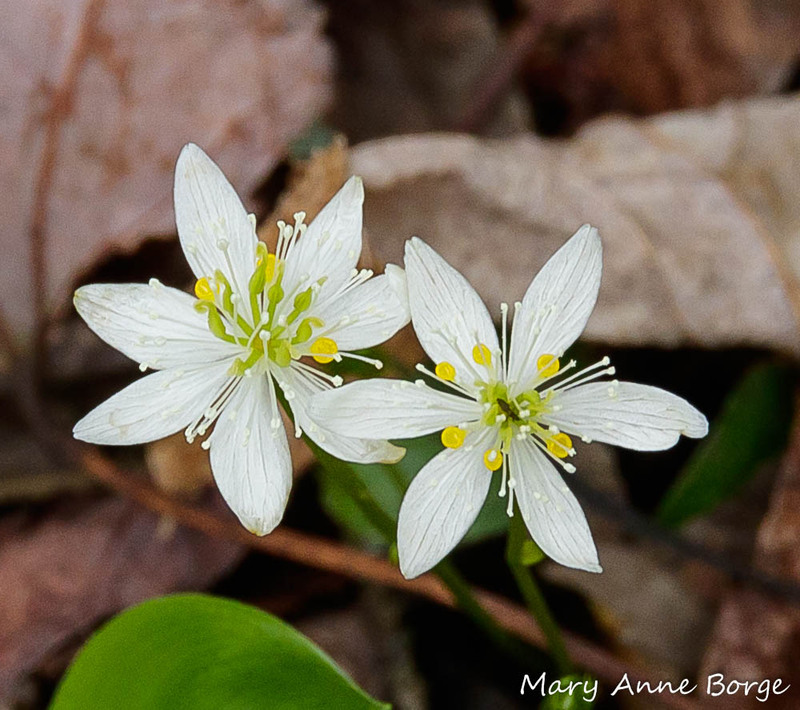 From a human’s eye view, the showiest parts of the flower are white petal-like sepals. 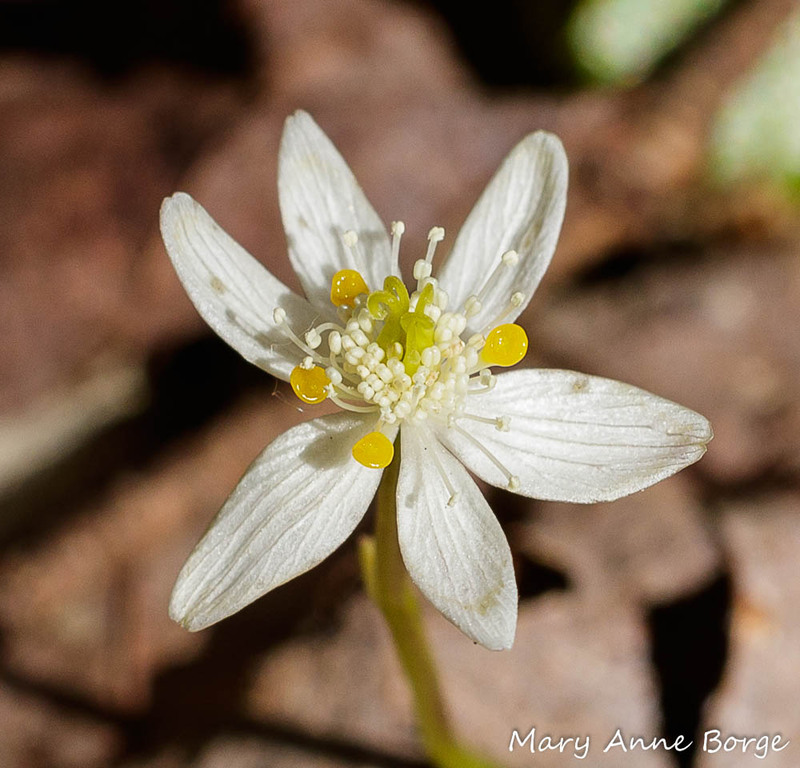 The primary function of sepals is to protect the other flower parts while the flower is developing, but in some plants, including Goldthread, they are also a showy part of the floral display to help attract pollinators. From a pollinator’s eye view, additional flower parts come into focus, and offer some surprises. Working in from the sepals, the unconventional petals make up the next whorl of flower parts. They are much smaller than the sepals, spoon-shaped, with bright yellow, rounded, concave tips. Not only are these bright yellow petal tips attractive to pollinators because of their color, but also because they produce nectar, an extra enticement for a pollinator’s visit. Next are the many stamens, the male reproductive parts. Goldthread stamens mature a few at a time, starting from the outside of their cluster. As the stamens mature they release pollen from the anthers at their tips. At the very center of the flower are the green pistils (or carpels), the female reproductive parts. Pollen must be deposited on the stigmas at their tips in order for pollination to occur. 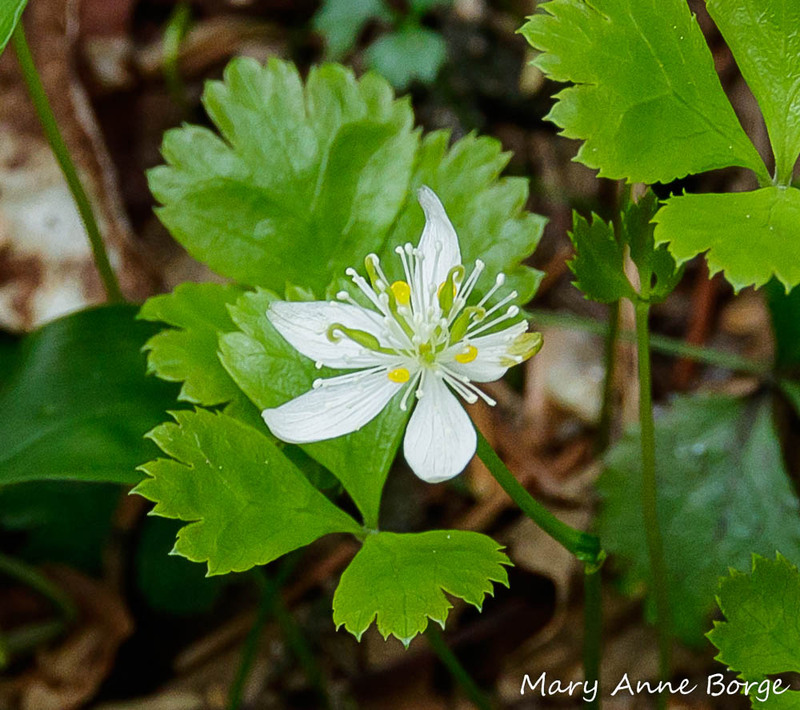 Goldthread (Coptis trifolia) flower. Only some of the stamens have matured. 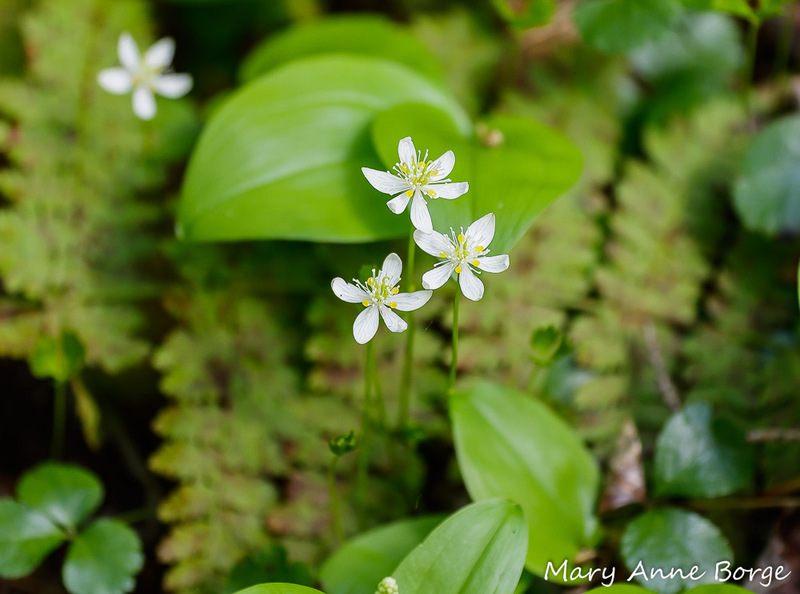 Goldthread (Coptis trifolia) flowers. (One with a tiny mystery visitor.) All of the stamens are open for business. Goldthread (Coptis trifolia) flower, When all of the stamens are mature, as they are in this specimen, they make a perfect rounded cluster. While we watched, a flower fly (Megasyrphus laxus) visited the flowers. This little fly seemed to be focused on harvesting pollen. Flies drink nectar, but they also need to eat pollen for its protein. Everyone needs a balanced diet! 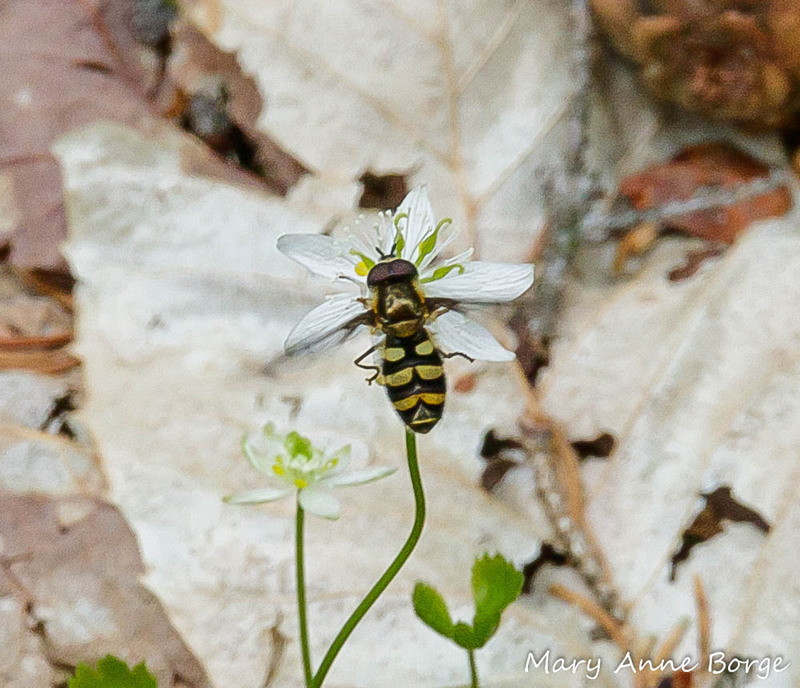 A flower fly (Megasyrphus laxus) hovering over a Goldthread (Coptis trifolia) flower. 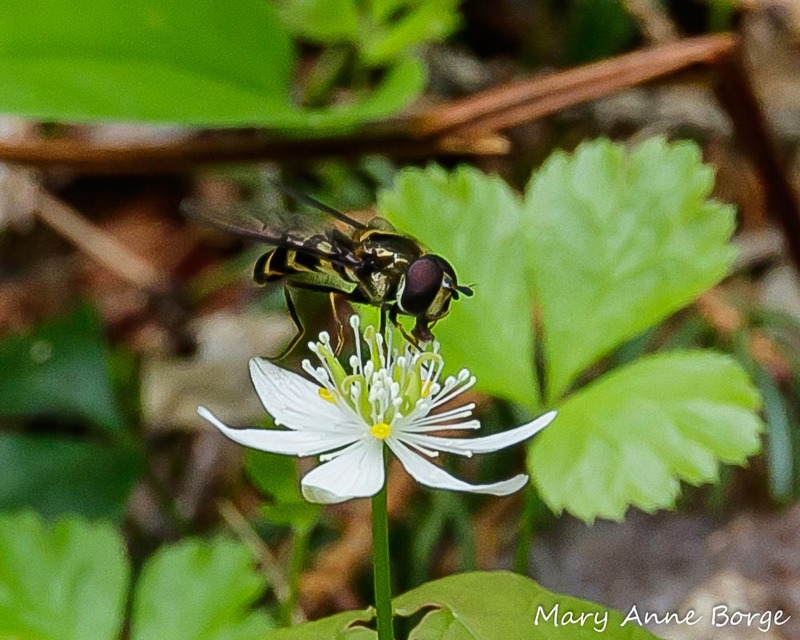 This group of flies is also called hover flies, or Syrphid flies. A flower fly (Megasyrphus laxus) eating pollen from a Goldthread (Coptis trifolia) flower. Its proboscis (mouth parts) are directly touching one of the anthers. If the flowers are pollinated, fruit capsules develop. Goldthread leaves are evergreen. In spring dark green leaves from the previous season are visible, and new leaves emerge concurrently with the flowers blooming. Goldthread (Coptis trifolia). The dark green leaf is from the previous season, the light green leaves have recently emerged. Goldthread’s scientific name is based on the shape of its leaves, with ‘Coptis’ referring to their deeply cut appearance, and ‘trifolia’ to the three leaflets of each leaf. The common name Goldthread refers to the plant’s golden colored thread-like underground rhizomes. Goldthread is a member of the Buttercup (Ranunculaceae) family. 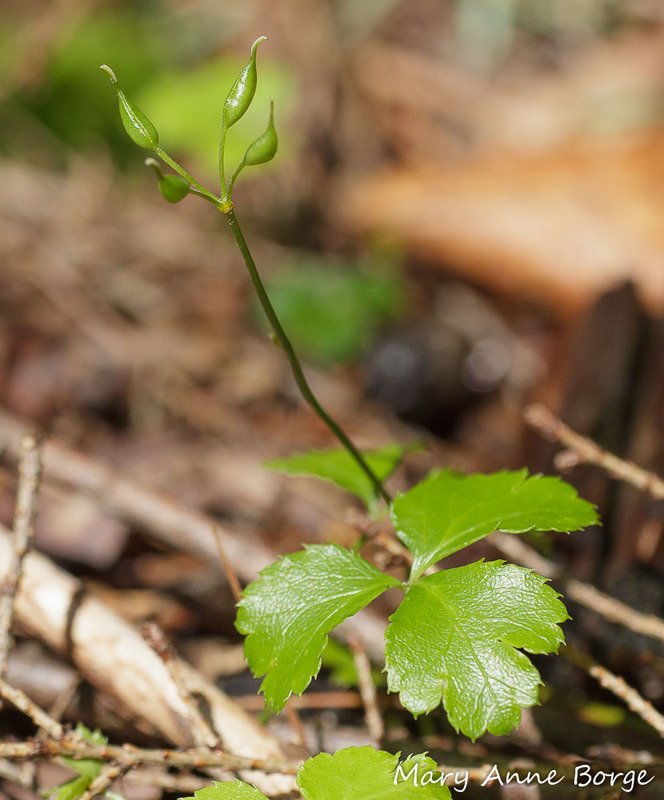 Like some other family members, Goldthread contains berberine, a compound that has anti-fungal, anti-bacterial and anti-tumor properties, among other things. Plants produce these properties to protect themselves from invaders and consumers. Although it can be toxic, in the proper doses, Native Americans have found many medicinal uses for this plant. Goldthread has a northerly distribution. It is native in Alaska, most of Canada except the Northwest and Yukon Territories, the northern tier of the United States from Minnesota east to Maine, and south in the east along the coast as far as North Carolina (except Delaware!). It can also be found in a few counties in Oregon. Its preferred habitat is rich, moist woods, and also bogs and swamps. Mauseth, James D. Botany An Introduction to Plant Biology. 2014.